Why Do Dog Trainers Hate Retractable Leashes? Injuries: Cuts, rope burns, and scary amputations. Imagine what would happen if your finger got caught up in the cord as your dog took off after a rabbit. There is also the potential that the cord could break, releasing your dog and then whipping back and hitting you in face as the spring recoils. Bolting dogs: If the plastic handle is pulled out of the owner’s hand, the dog is now being chased by a scary, noisy object. Tangled dogs: If two dogs start to play, they are very likely to get tangled in the cord, which can lead to fights and injuries to both dogs and humans. Dropped and broken retractable leashes: That plastic handle is extremely hard to hold on to even if only a medium sized dog hits the end of the leash full tilt. 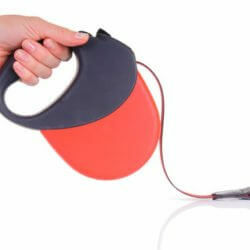 If you do manage to hold on, the cord is held inside by plastic components that could easily break under stress. Lack of control: If your dog is 20 feet in front of you and chooses to run into the street, you won’t be able to stop him from running into traffic. There is also no way to easily bring your dog closer if he is pulling toward something. So, as a dog trainer, would I ever use a retractable? Yes, in wide open spaces, with a well-trained adult dog, that I would otherwise have off leash if the law allowed.